While you can get some of the best possible produce at your local farmers’ market, I like the fact that you can also get crappy vegetables at the farmers’ market. At the grocery store they certainly have crappy vegetables, but they charge full price for them. At the farmers’ market you can get a bag of “second” quality for cheap! I picked up a large bag of carrot seconds and promptly forgot to do anything with them. 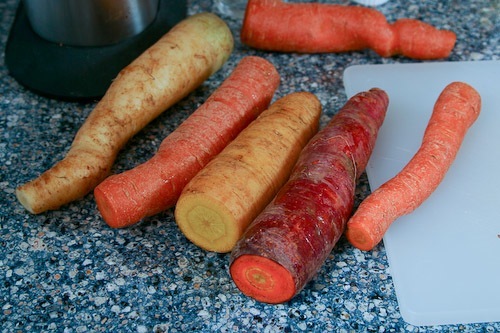 After doing nothing for a couple months (carrot keep well in the fridge), I did a little Googling for recipes requiring 2 pounds of carrots. 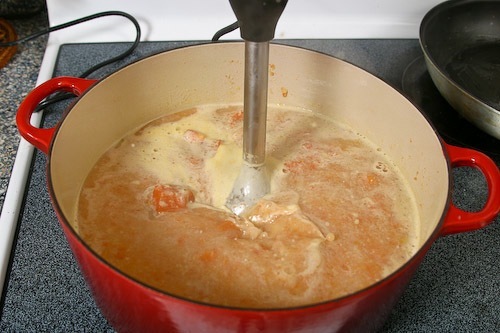 I came across this great recipe for carrot soup from the first edition of the Moosewood Cookbook. I skipped the almonds and it still tasted great. The soup has a sweet, but earthy flavor. There are lots options for the soup too, and luckily I had the ginger and yogurt lying around. Instead of whisking in the dairy, we topped the soup with a dollop of minty Greek yogurt, which was left over from a lamb dish we made. I used an immersion blender so I didn’t have to let the soup cool. Even if you use a traditional blender, you don’t have to let it cool all the way. 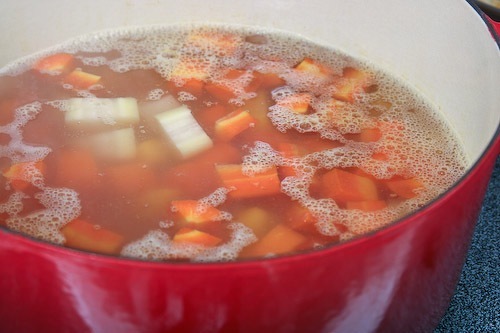 Place carrots, liquid and salt (and potato if you are using it) into a medium sized soup pot and bring to a boil. Cover and simmer for 12 to 15 minutes. Let it cool to room temperature. Saute the onion, garlic and nuts in the butter until the onions are clear. You can sprinkle in a little salt to help draw the moisture out of the onions. Towards the end of cooking, stir in the seasoning combo of your choice. Whisk in one of the dairy products. Serve! It’s a fantastic soup, isn’t it? I love that they cook the onions separately. It basically works out like a tarka for the soup. I’ve made my version with almonds and cashews, nutmeg, dried mint, and cinnamon, but added a swirl of good rose harissa at the end. It was simply – perfect! This is my version: http://maninas.wordpress.com/2008/12/08/the-best-carrot-soup-ever/. It works really well with pumpkin, too. I also used a similar technique to make a green lentil and carrot soup, which was excellent, too. – You can tell I’m a fan of the recipe! I like the new (?) design! I just came across your blog. You have amazing photos and great recipes. 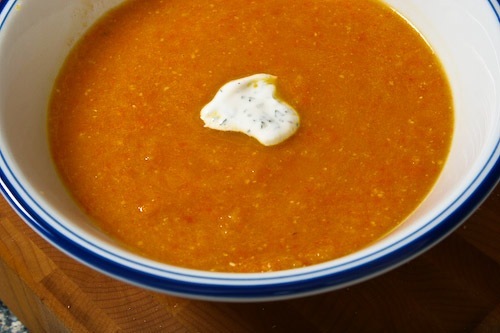 Love the flavors in this carrot soup.